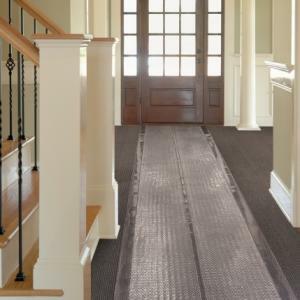 Where rubber and foam floor mats are mainly used to protect people from slips and spills, plastic mats are mainly intended to protect the floor surface itself. Suitable for both bare floors and carpeted floors, a plastic mat is the simple and inexpensive way to provide protection. A very common problem with certain types of furniture is there can be a tendency to dig into the floor surface and leave deep grooves or even cavities in the floor. Plastic mats absorb some of the pressure and help to spread it over a larger surface area so that there is no “dig in” effect. It’s based on the same principle as a camel’s foot. If camels had hooves like horses, they would sink into the sand. Instead, they have evolved a foot that spreads over a large surface area so they can almost glide across the desert as they walk. Humans developed snow shoes for the same reason. 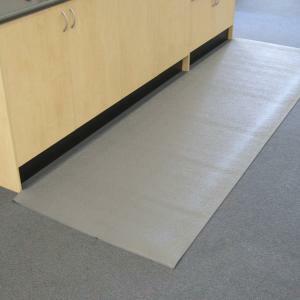 When you use a plastic mat, the mat takes the downward force and spares your floor from harm. Chairs are not especially heavy, but the downward force is greatly multiplied when people sit on the chairs. It can be most noticeable when the chairs have castors because castors used for office chairs are usually composed of two thin, cheap, plastic discs separated by another piece of plastic. This means the weight and pressure will not be spread very well. On bare floorboards, you’ll see impression marks. On carpeted floors, the opposite problem usually occurs. With a carpeted floor, you will find that the chair does not glide easily enough over the surface, and may have a tendency to dig in and get stuck. This can be annoying, and in certain circumstances, it can even be dangerous. Gliding office chairs directly over carpet can also have a tendency to build up static electricity, which can be very harmful to sensitive electronic equipment such as computers. Using a plastic floor mat provides some insulation against static electricity build-up, and also makes it possible to a wheeled office chair easily over the surface without digging in or causing damage. For ordinary chairs that have legs without wheels or castors, a plastic mat will provide some extra safety by increasing the traction between the chair legs and the floor. This will make it more difficult for the chair to accidentally tip over or slip. If you want the best value plastic floor mat money can buy, you should buy it from us. We are Australia’s specialists in floor mat technology, and we provide solutions especially engineered for safety, practicality, and affordability. You will love the floor mats you get from MatTek because we’ve worked hard to create mats that live up to all their promises. To find out more, or place an order, call us on 1300 365 012.